‘It is becoming clearer and clearer that orders were placed for explosives in the shipyards of the Tyne as far back as February.’ Tam Dalyell (p.77). It was hoped that this would lead to some strengthening of the British military presence in the south Atlantic. That would in turn assist calls for Argentine national unity, which was greatly lacking in the government of that country. That was the reasoning. But, it didn’t work that way! On the 8th March, the Prime Minster spoke to Nott her Defence Secretary and asked him how quickly the Royal Navy ships could be deployed to the Falkland Islands if required. He advised her that it would take 20 days to deploy Royal Navy ships to the Falklands if required (Thatcher’s Torpedo, 27). “…preparations for the task force which appear to have started several weeks before the Argentine invasion of the islands.” (G&R). Then on 31st March, the Prime minister brazenly told the Commons that the Falklands crisis had come ‘out of the blue’. In July the British Embassy in Buenos Aires reported such an interpretation in Argentina. A second and third letter from Carrington to Nott warned of consequences for Falklands if it were withdrawn. Carrington therefore resigned upon the invasion, and Francis Pym stepped in instead. For over a decade the ex-inhabitants of Diego Garcia had been languishing in Mauritius where they had been dumped by the British government, with no rights or even compensation for losing their home-island, just taken over by the US military. The entire population of an island kicked out, just like that – and yes, by Harold Wilson. Then suddenly, on 20th March 1982, British officials flew over and made them an offer – by March 27 the deal had been signed, they got four million pounds: that was the forward planning! The racist contrast between these two sets of British subjects having different skin colour – the Diego Garcians having their home stolen and the Falkland islanders having their wishes ‘paramount’ – would have been too politically damaging (p.143). Clearly, the barmaids of Gibraltar knew what was what. On 28th it was announced that there would be a Total Exclusion Zone around the Falklands covering aircraft, warships and submarines, effective from the 30th. On that very day, 30th April, the War Cabinet (Thatcher, Pym, Parkinson, Nott) knowing that the Americans had given up on the peace process, decided to try and sink the Argentine aircraft carrier outside the Total Exclusion Zone – without notifying anyone. The Total Exclusion Zone was set up on the 30th April, yet within two hours of setting it up the Government had decided to take action that extended it.’ Clive Ponting, (p. 85). They could have given a warning, ie given the option to the 25 de Mayo to withdraw, but chose not to: in the event HMS Splendid supposedly shadowing it, could not locate it. It might have been a threat because of the range of the planes it was carrying (had the wind blown – they needed wind to get lift-off), whereas its escorting vehicles were not because they were only equipped with Exocet missiles, having a 40 mile radius. ‘I know Mr Pym and the Attorney General wrote a letter to the Prime minster afterwards, and I think their concern was that if the submarine did find itself in a position to attack the aircraft carrier 25 de Mayo, in public perception and the international opinion perception, this might be going further than Article 51.’ UW 73. Let’s hear from Wade Tidbury, who was on board HMS Alacrity. There were several thousand Argentine troops on the islands. One may take a different view here, that it was the impact of actual warfare that induced Galtieri to start seeking rather suddenly for some viable exit route, i.e. a peace plan. It then had a majority of 35 in the House. The majority of Britain will not be rejoicing with the Prime Minster at the loss of life when the ship was torpedoed – without any declaration of war, well outside the Exclusion Zone. Nott: the feeble Defence Secretary. These were swiftly moved out of office so they would not have to answer embarrassing Parliamentary questions: Whitelaw was elevated to the Peerage after the general election of 9 June 1982. Nott quit politics in December 1982 and was knighted. Pym was deprived of his Foreign Secretary office following the June elections. Cecil Parkinson remained in office as Trade and Industry Secretary, in which capacity he could not take questions on the Falklands. For years and years we’d said what we really want is a small, local war where the Harrier can show itself to advantage – not many people killed, you know .. and we had one. And it was called the Falklands. No other British aircraft could have fought such a war, because Britain no longer had aircraft carriers large enough to accommodate the take-off runs of conventional fighter aircraft. In total 24 Harriers took on more than 200 French-built Mirages – and won. 23 Argentine fighters were shot down in aerial combat while only 2 Harriers were lost. These were due to bad weather, not combat. Following its unprecedented success in the South Atlantic, foreign sales of the Harrier doubled and redoubled. Soon it became the first-choice frontline attack aircraft in air forces the world over. This ‘analysis’ is nothing more than the relaying of mendacious drivel. – You jump from attempting to imply that the withdrawl of Endurance was aimed at luring the Argentines into an invasion to acknowledging that the withdrawl had been planned since the previous year. – You point to the attempts to settle the Diego Garcian issue by buying them off but then fail to acknowledge that Whitehall had been trying to wash their hands of the Falkland Islands as well. In what way, then, is this relevant? – You assert that the Argentines believed action to be restricted to the exclusion zone, but then fail to acknowledge that fighting had already taken place on South Georgia – outside the exclusion zone – including the depth-charging and capture of an Argentine submarine, several days before the sinking of Belgrano. Hector Bonzo (captain of the Belgrano) said that he considered himself to be on the front lines and had been authorised to attack any British ships coming within range. Belgrano was not on a pleasure-cruise. It was on a war patrol at a time of war at a time when British forces had already engaged in combat with an Argentine submarine which they would have sunk had it not surrendered. – You relay hear-say from unidentified Gibraltan bar-maids as if it were confirmed proof (of something), despite the fact that by the date you are talking about, the Argentine landing of ‘scrap merchants’ who had raised the Argentine flag in South Georgia thus precipitating the crisis. – You ignore the fact that the Falklands dispute had been brewing for some years, that Jim Callaghan had previously prepared the dispatch of a small task force during a similar period of tension in 1978, and that the expectations in 1982 were that if tensions did return, that they would be in the form of sabre-rattling. No-one on the British side expected the invasion that did come. 1) The ship-yards of the Tyne do not produce explosives. 2) If he is referring to orders from the navy, well yes, the navy makes use of explosives all the time. What does this prove? 3) Explosives by themselves are not especially useful in the kind of warfare that took place on the Falkland Islands. The missiles, shells, bombs, torpedoes used during the conflict all came from existing stocks – which is part of the reason why we ran low and had to be replenished from NATO stocks. 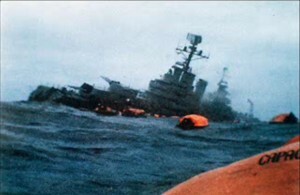 The specific torpedoes that sank Belgrano were of a model that had been manufactured and used by the navy since the second world war. And this is not even to get into the silliness of trusting a man like Dalyell as your source – the same guy who said that Blair was under the influence of a “cabal of Jewish advisers”, including Jack Straw and Peter Mandelson – neither of whom are actually Jewish.